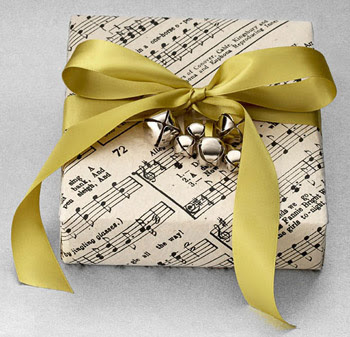 So I'm slightly obsessed with Etsy right now, and this post isn't really 'Christmassy' so much as it is 'vintage deserty.' But in the cold months, sometimes we need to be reminded of the heat. 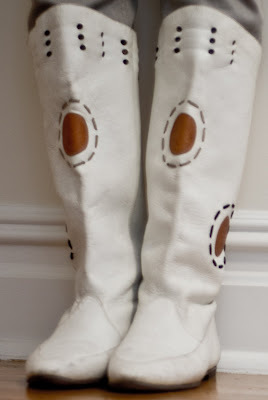 A couple years ago, I heard about Owl Vintage in my random research on fashion of the Southwest in the 1940s and 1950s. Owl Vintage is amazing in that they focus on upscale, cool vintage stuff that evokes that Southwesterny Southwesterness that I'm sure each one of us has longed for (if even for only a hot second while listening to The Eagles) at some point in our lives. I mean, I don't know about you, but I totally imagined that everyone who stayed at the Hotel California dressed in clothing hand-selected for them by the minds behind Owl Vintage. No idea what I'm talking about? That's ok, I'll show you. First, push play on this music video, then scroll down to look at the images below. Imagine mirages of silver light off in the distance, birds soaring high in the darkening sky, and crunchy dry desert earth below your feet. 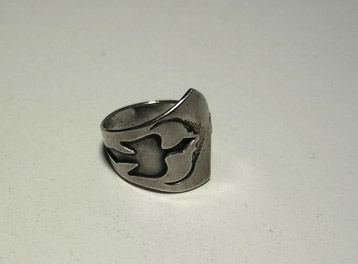 This vintage sterling silver ring features a shadowboxed bird in flight. Possibly Hopi. ca. 1970s. Found on Owl Vintage. 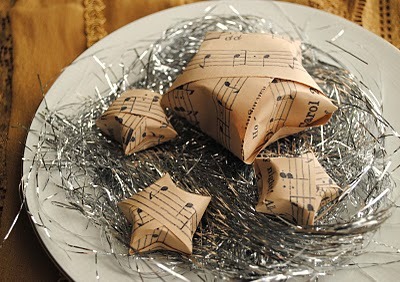 Would fit rather nicely in those star-shaped gift boxes pictured above. $55. This silvery sequin crop bolero is a perfect layering piece to add some sparkle to your Hotel Cali outfit. Trimmed with Swarovski crystals on the sleeve cap, this little ditty is silk chiffon covered with clover shaped sequins and has a silver frog closure. 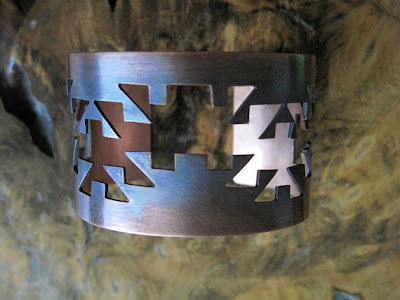 Made by Oda, an awesome team of designers who hail from the Navajo and Korean nations. Size XS. $275. And now you have to throw some turquoise on it (if you want). 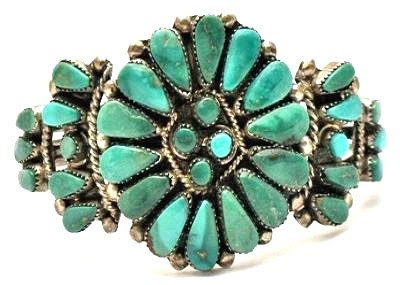 This is a dazzling Navajo silver and turquoise cluster cuff bracelet, circa 1970s, from Vintage Treasures 09. This bracelet features hand cut top grade blue-green turquoise set in sterling bezels in a cluster design. The cluster is embellished with hand twisted sterling silver rope. Two rows of turquoise accent the sides. $329. Vintage Leather Rodeo Boots from Kitsune Vintage. Non-Native, but they should be. Somebody, own them. $60. 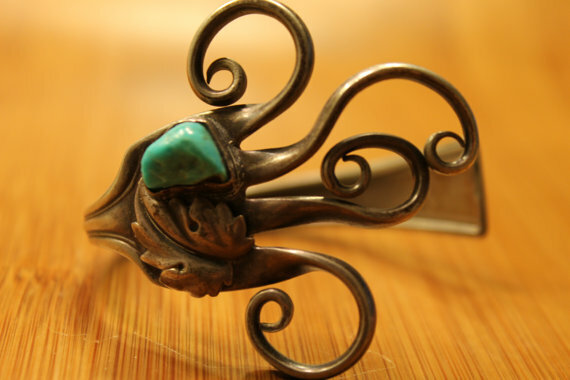 If turquoise isn't your thing, try out this Dakota Cuff made by Birds Of Prey, a jewelry atelier born from Spanish, Mexican and Native American descent, mixing modern with traditional design and processes. $90. This beaded ring was made by Joni Stinson (Creek/Cherokee) of Omaha, Nebraska. 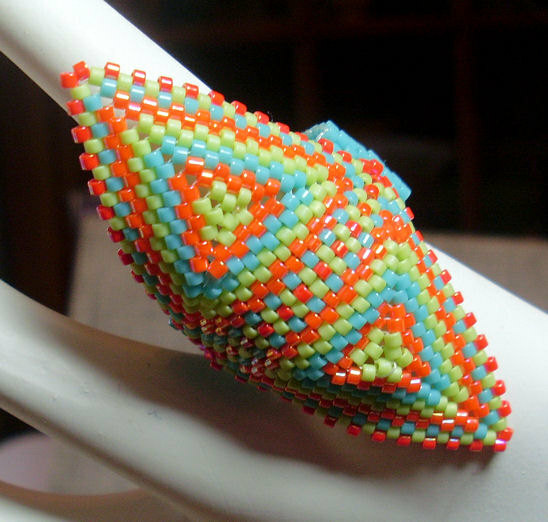 This bold ring is beaded in Delica seed beads in lime, oranges, and turquoise. Comfy, flexible, and great for making a statement. $32. This vintage Native-inspired silver and turquoise bracelet, circa 1960s, is a true piece of art. It's actually a WM Rogers fork from 1863 that has been bent and twisted into flowing loops. Non-Native, but super Old West and cool like that. From CosmoBeets. $100. 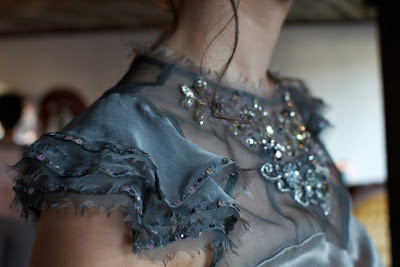 This shirt, the Alexis embellished silk blouse, is a whimsical little number made by the fashion team Oda. With three-layered fluttery sleeves, vintage lace, and a bejeweled bib neckline, it is a perfect top for a professional meeting, a dinner party, or even a night out on the town. $410.